Hi you guys! This is a very cool question, thanks for bringing it up. I will have to go back and check out the end credits of Daybreak to make sure I know what you're referring to. If you recall, the end credits when the show aired o TV was always the same piece. So, I think the version you're talking about is the DVD / BluRay only version. I think it was a compilation of pieces I'd composed for the final episode, which was released in its entirety. So, I think all those elements are out there, even if not in the same form as the end credits. I have always hoped to release more music from BSG. There is so much of it. A number of factors have prevented that from happening, not the least of which is my intense writing schedule these days. It's very hard to set aside time to plan an album of older music when I'm so busy working on new material. But, absolutely rest assured, I fully intend to do it at some point. It might take a few more years for all the factors to line up, but its a high priority for me. So it sounds as if there may be no major hurdles to overcome regarding copyrights/legal stuff with NBC/Universal? AWESOME!! One less headache. I know this may sound naive but I'll put it out there anyway.....I am very technically inclined (EE by day). If there was ANY sort of processing work that could be done I would GLADLY volunteer for that! I know that putting together the Unreleased Music from 4 seasons and all the specials (MiniSeries, Razor, Plan, B&C...) can only be accomplished from the person who wrote it, but *IF* there was any sort of "busy" work that consist of crunching, cutting, converting, encoding/transcoding.....I would jump through some major hoops to do this for you. I build custom PCs on the side, so I have some pretty powerful machines at my disposal. Again, I know this sounds naive and you have all you need right there in your studio and/or friends willing to help out, but I would do anything to help move this project along I know it's going to be a VERY TIME CONSUMING project given your work ethic and the scope of material. I see (hear) all the beautiful works you have mastered since BSG and understand what you mean by going back to older material when you're trying to put out new stuff. Baby, wife and life obviously come first!! I(we) wish you nothing but the very best life has to offer Bear. Never met you but have that intuition that you're truly a man of great kindness, understanding, hard work and love. One of the unreleased tracks I found on web is titled "The First Highlander". Last edited by rms8 on Tue Jul 05, 2016 7:22 am, edited 2 times in total. ...I have always hoped to release more music from BSG. There is so much of it. A number of factors have prevented that from happening, not the least of which is my intense writing schedule these days. It's very hard to set aside time to plan an album of older music when I'm so busy working on new material. But, absolutely rest assured, I fully intend to do it at some point. It might take a few more years for all the factors to line up, but its a high priority for me.
" As I mentioned before, I’m hoping to assemble a multi-CD set of un-released material from all four seasons, perhaps even including demos, sketches, out-takes, source pieces and other odds n’ ends I’ve produced for the series. I am certain that there will be more “Music of Battlestar Galactica” concerts this year and next, one of which will hopefully lead to a concert DVD. There are also tentative plans for more ballet performances, orchestral concert suites, documentaries and sheet music releases. So, I guess what I’m trying to say is… I’m not done delivering the Galactica goods. (I’m also hopeful that we’ll be able to release a soundtrack album for the super-cool top-secret video game project that I scored recently. If you guys like the score to BG, you’re going to frakkin’ flip out when you hear this! Details will be announced as soon as I’m allowed to say what it is!) 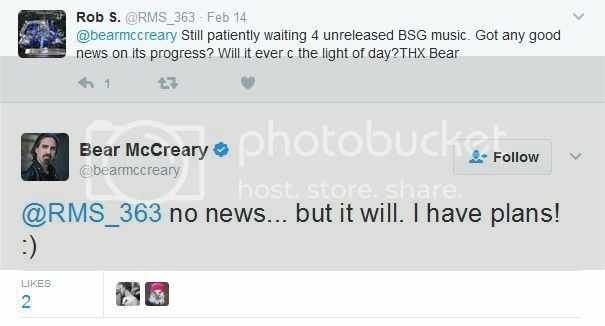 "
Any update on releasing the UNRELEASED BSG music? I've been looking SOOOOOOOOOO forward to this for so long. Hope all is well with work and family! .....I have always hoped to release more music from BSG. There is so much of it. A number of factors have prevented that from happening, not the least of which is my intense writing schedule these days. It's very hard to set aside time to plan an album of older music when I'm so busy working on new material. But, absolutely rest assured, I fully intend to do it at some point. It might take a few more years for all the factors to line up, but its a high priority for me. Is there ANY CHANCE at all that we might have a taste of the Unreleased Music from BSG before 2016 shines out? I've been waiting so long for this material as I'm sure many others have been too. My biggest fear besides it never happening is that the longer it takes, the fewer people will be interested. Your BSG scores are absolutely stunning and to have "new" material from the same world would be like having Christmas everyday for a month!!!! I second what Rms8 said! I am curious to know if there will be a final soundtrack of unreleased music for Battlestar! I would love to hear additional Prelude to War variants that are featured in BSG as well! I'm also curious if we will ever get a second final soundtrack or iTunes release for Terminator: The Sarah Connor Chronicles, Season 2! It was unfortunate that the series was cancelled, but we should have had a soundtrack release for the second season. The music is too good to just not be released! Anyway, keep up the great work Bear. New to the forum, but definite interest here too. Hopefully he can release all the previously unreleased music to BSG that I and so many others have been patiently waiting for for literally years now. I just fear the longer this gets put on hold, the less attractive this music will be since the show has been off the air for so long. My family and I are actually watching the series again. 4th time too (5th for me). We absolutely love it, and my wife actually hates SciFi. She loves the story, characters and Bears beautiful score throughout. PLEASE Bear, please get this out to the loyal BSG fans. As I have stated else where on this site, I listen to this music literally every day. I highlight all the soundtracks and play all with "shuffle" turned on. It plays in the background while I work. It's been years. Any good news on the progress of making available the unreleased BSG score?